The Kinvey high productivity platform makes it easy for Node developers to create native apps across multiple platforms while staying in control. Being a Node developer can span across many different types of programming these days because Node can be used for so much, from frontend to backend, machine learning to IoT. I started my career as a Node engineer mostly working on the backend and have watched Node grow to surpass many programming languages in usage and popularity. The Node ecosystem and community have also thrived and evolved each year. When I joined the Kinvey team, I was excited by all the ways the platform aligned itself with Node and lent itself to the ways I was already programming with Node. I wanted to point a few out to you today, so you could be excited too 😉. One of the benefits of Node is the ability to keep your code scalable and modularized. This lends itself to building out microservices that allow you to have a "single responsibility" type building model for your application. That is to say, one app that does one job. This makes scalability and organization of your overall application much more manageable. Instead of worrying about breaking your billing logic because you wanted to change part of your inventory process, you separate them into individual services and leave that stress for another day. The Kinvey team realized the benefits of this as well and developed the Kinvey Microservice Framework for building, deploying and maintaining scalable microservices. We also take some of the infrastructure work off your hands by autoscaling to the highest degree on our serverless cloud platform. That way you don't have to spend time configuring or developing low-level code with infrastructure providers. You have the option of creating low- to no-code microservices using our RapidServices like RapidAuth and RapidData, and FlexServices like FlexData, FlexAuth, and FlexFunctions. The RapidAuth and RapidData services Kinvey provides allow you to easily hook up authorization and data integrations with no code. An old manager of mine used to joke that we all had a finite amount of keystrokes in our lifetime (in case you wonder what yours is), so we wanted to help you out by giving you less code to write 🤗. Sure, I kid, but I have never found coding up these integrations to be quick or painless job. RapidAuth is pretty much what it sounds like: getting users authenticated rapidly. We do this with our Mobile Identity Connect service which connects your app to enterprise identity and single sign-on solutions. We use OAuth2 as an underlying identity protocol for authentication and redirect users as necessary. There are many options to work with MIC including: SAML, OAuth2, OpenID Connect, Active Directory, LDAP, SAML-WRAP, Facebook Auth and Custom Authlink. A RapidData service lets you use integrations like SAP, Salesforce, Sharepoint, NoSQL and Rest APIs to feed data into your applications instead of having to develop or deploy complex APIs. Having access to data and APIs already helps us build robust applications and now Kinvey can help you make that process easier and faster. This can help you cut down your coding time on integrations or use it to add even MORE integrations! Kinvey is actually built using Node so we've got a lot of Node devs creating what you're using. Being Node developers helps us realize what is important for fellow Node developers. For instance, we recently made it so that you can use any LTS version of Node. You just choose the version you like and we install the latest patch of that major version. From here on out we will be aligned with Node's release schedule to stay up-to-date and also avoid any complications with versions of Node that are no longer under maintenance. We also know the value of the Node ecosystem. We have members of our team who have contributed to Node core and are active in the Node community. We also utilize the NPM ecosystem with our Flex Services to make it easy for you to incorporate them into your projects. Kinvey FlexServices are lightweight Node microservices used to integrate data and functional business logic into your application. You just need to install and require the modules like you would in any of your Node apps. We like to keep you in your comfort zone aka productive. You can check out this article on Getting Started with Kinvey FlexServices to learn more. Practically every framework out there today has a Command Line Interface tool, because they're awesome, duh. Of course, it is also handy that most of our code editors have bash integration so that we don't have to switch from screen to screen, or from coding to GUI, in order to run commands for our application. Kinvey is right there with you. Our CLI tool lets you work with your FlexServices, business logic, applications, app environments, and collections all through CLI commands. Our team is constantly updating the CLI to help it help you 😉. Check out the changelog to keep up-to-date with all the newness. The CLI also can be utilized in your CI pipeline to enable full continuous integration/continuous deployment of your apps through Kinvey. By using the CLI within any common CI tool such as Jenkins, Travis, etc., you can store your Kinvey Flex Services and application metadata in your version control system of choice (e.g. GitHub), and integrate and deploy your Kinvey apps automatically. I wanted to make a shout-out to a few other features Kinvey offers that aren't specifically Node-centric but are great, especially for creating multi-channel applications. In particular, I wanted to touch on a few things that I always found a bit cumbersome while doing Node development: security and offline support. Security and privacy are tricky, especially when it comes to mobile devices. 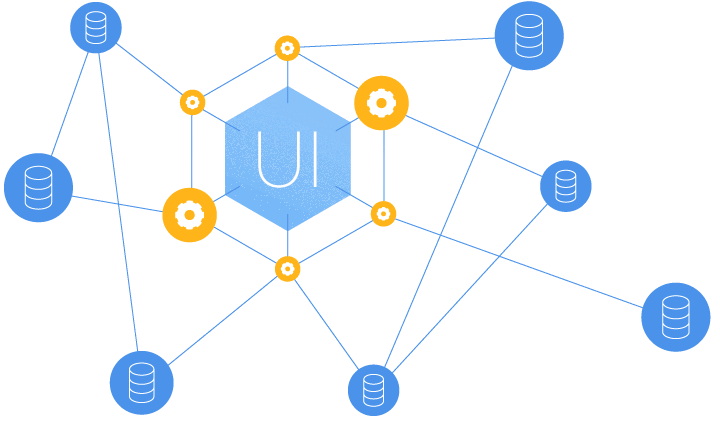 Kinvey utilizes secure, enterprise-grade serverless cloud platform solutions, isolating and protecting data sources and networks from client applications running on untrusted devices and their networks. You can never be too safe. All of the Kinvey client libraries encrypt data on the client device using AES-256 and data is encrypted in transport using TLS 1.2. There are also more options that the Kinvey platform supports for secure connections to your systems including IPSEC VPN, SSL/TLS VPN and our own Secure Gateway solution. Work with sensitive medical information? Kinvey provides built-in HIPAA compliance. There's much more to the security we provide, if you want to learn more check out our whitepaper on Kinvey Cloud Services Security. Although we as users are more connected than ever these days, our network connections aren't always the most reliable. Thankfully, the internet is advancing, giving us different methods to deliver data to users fast, even if they have a slow connection. I've written enough service workers to know just how complicated building out offline functionality can be. Service workers are really powerful and can do so much for controlling how and when to deliver data, but... not easy. This is where Kinvey can help you advance your application without slowing production down. Knowing how important it is to get data to your users fast, the team created Kinvey Accelerate. Basically, it provides secure cloud storage for your datastore to cache data from your backend systems and services. When your data needs to be accessed it delivers it directly from the cloud in synchronized batches to limit the impact to the infrastructure and deliver data in sub-second responses. The kicker is that the Kinvey client SDKs provide several tools for working with offline data, letting you cache and sync when your users go offline. This means you have two-way syncing between the device and backend datastore, so when a connection is restored only changed data gets synced. This saves bandwidth and gives users the super quick response time they expect even on slower connections. On top of that you can set this up with no code, just check the 'Use offline storage' box ✨. I hope I gave you a nice peek into some of the benefits that Kinvey brings to Node developers. The goal is to help you create native apps across multiple platforms quickly and easily while still being in control. As Node developer ourselves, our team knows where nuisances lay in the coding processes. We try to take care of those nuisances for you so you can work on your actual product and release features your users are asking for. Check out more information on the Kinvey high productivity platform here, or jump right in to some docs and tutorials at our devcenter. Feel free to reach out to us if you have any questions or want more info. Happy coding!